'Liquid Thinker' Damian Hughes is the keynote speaker at the University of Derby Sports Centre ahead of workshops designed to develop the county's coaches - from grass roots through to elite level. 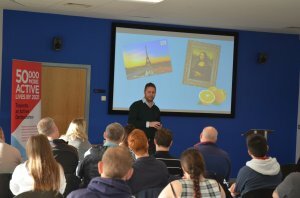 Barrack Obama, Finding Nemo, Albert Einstein and Michael Burke were just some of the diverse names professor Damian Hughes referenced to bring to life his thinking at the 2016 Derbyshire Sport Coaches Conference, held at the University of Derby Sports Centre. The sports psychologist and writer, known as the 'Liquid Thinker', also cited examples featuring Sir Alex Ferguson and the late boxing trainer Manny Steward during an engaging keynote speech that challenged delegates to think differently about how they lead their coaching sessions. Coaches from across Derbyshire and beyond, working at both elite and grass roots levels, listened intently as Hughes spelt out his 'Five Steps to a Winning Mindset' that he hoped could help those in attending improve their session delivery. His opening speech preceded a choice of nine workshops – some practical and some theoretical – designed to widen the coaches' skill set. They included improving engagement with women and girls, the importance of emotional intelligence in coaching and managing challenging behaviour. "Today's conference has been fantastic and Damian Hughes' keynote got it off to a great start, setting the tone for an engaging and interactive day," said Suzanne Watson, coaching lead for Derbyshire Sport, who organised the event. "We hope coaches will go away thinking slightly differently, thinking about their participants more and how they can engage with them. We also hope we've give them tools that they can practically use every day to get people active who have never been active before. 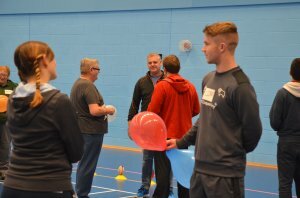 Jon Woodward from Sports Coach UK used a balloon game as part of his session. "The coaches' conference has been a really good opportunity for coaches to network and have conversations that they never had before with people they have never met." Jon Woodward from Sports Coach UK used a unique balloon blowing game to help put his delegates at ease before explaining how to deliver engaging sessions and then demonstrating the FUNdamentals of movement. He said: "Hopefully people will be aware after today that we have a new suite of workshops at Sports Coach UK that coaches can apply to their own coaching and in their own arenas. "It is a little bit different to what has gone before, but we like different engaging and creative, and the feedback has been very good. " Delegate Conor Moore, a Physical Activity and Health Advisor at Derby County Community Trust, found the day changed some of his perceptions on coaching. "I've taken a lot from the workshops that I can take into my job," he said. "Every coach has their own ideas, but you can always learn more. "I thought the balloon idea from Jon Woodward's workshop was a great idea that I can take away and use to help get participants in my sessions moving. He also opened my eyes to making sure I don't judge a book by its cover and listen to people's ideas. "Damian helped me think about the little plans you can have as a coach and how you can help get information across to people." Derbyshire Dales juniors netball coach Bella Cottrell, 16, is a former young leader who has been invited to join the This Girl Can Coach programme that is aiming to boost the number of women and girls coaching in Derbyshire. She was given a place at the Coaches' Conference through the programme to help her continue her coaching development. She added: "I've found that talking to different coaches and getting a different perspective on things is really useful. "At school you are in a little bubble, so to hear different opinions and reasons for doing things in coaching is a big plus for me."